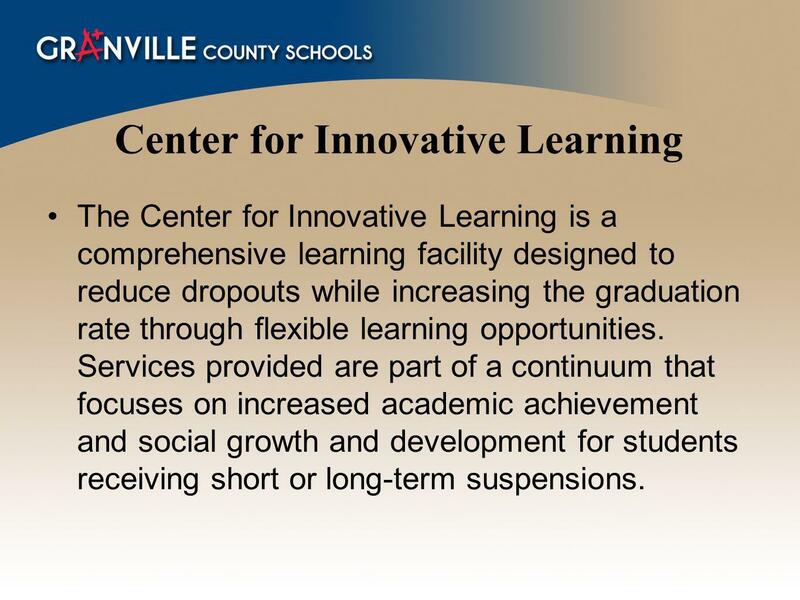 The Center for Innovative Learning is a comprehensive learning facility designed to reduce dropouts while increasing the graduation rate through flexible learning opportunities. 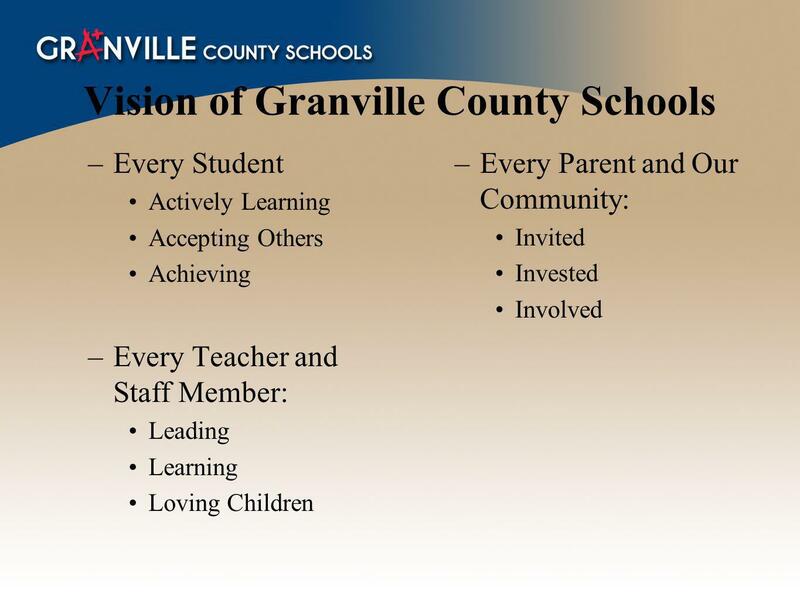 Services provided are part of a continuum that focuses on increased academic achievement and social growth and development for students receiving short or long-term suspensions. 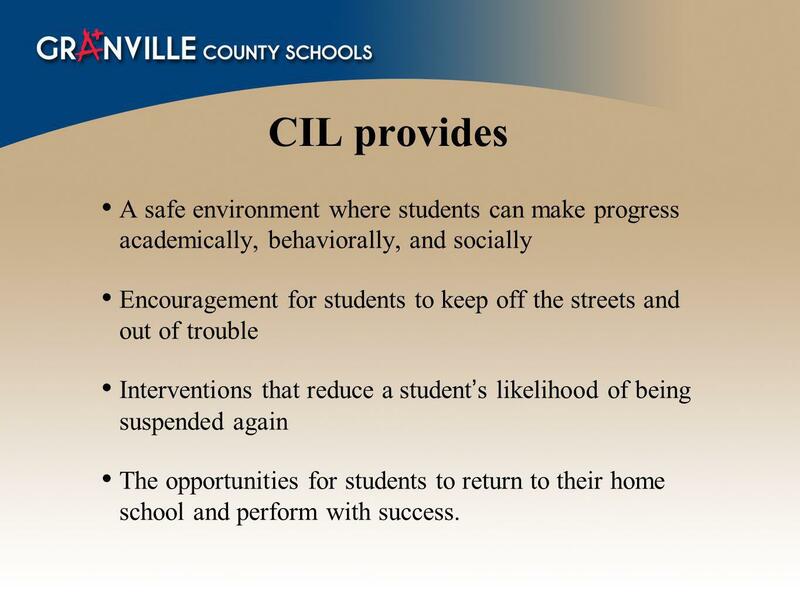 7 CIL provides A safe environment where students can make progress academically, behaviorally, and socially Encouragement for students to keep off the streets and out of trouble Interventions that reduce a student’s likelihood of being suspended again The opportunities for students to return to their home school and perform with success. 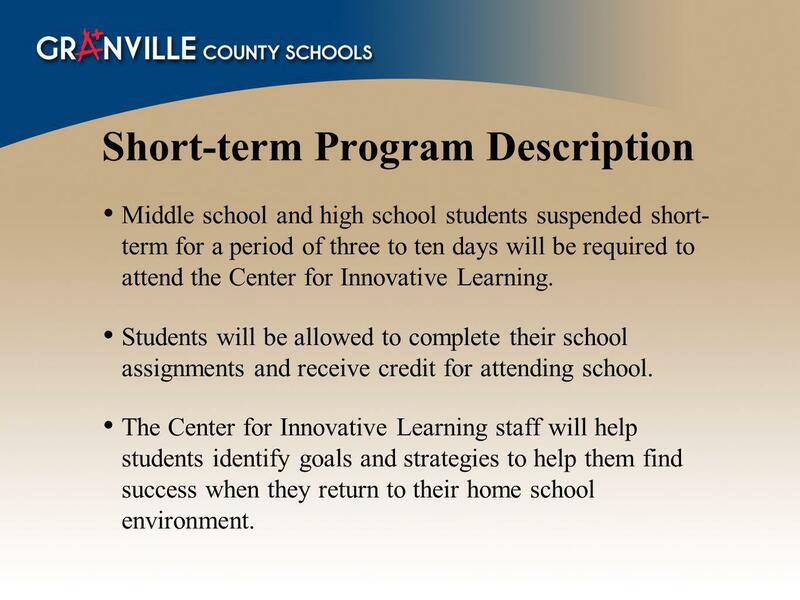 Middle school and high school students suspended short-term for a period of three to ten days will be required to attend the Center for Innovative Learning. 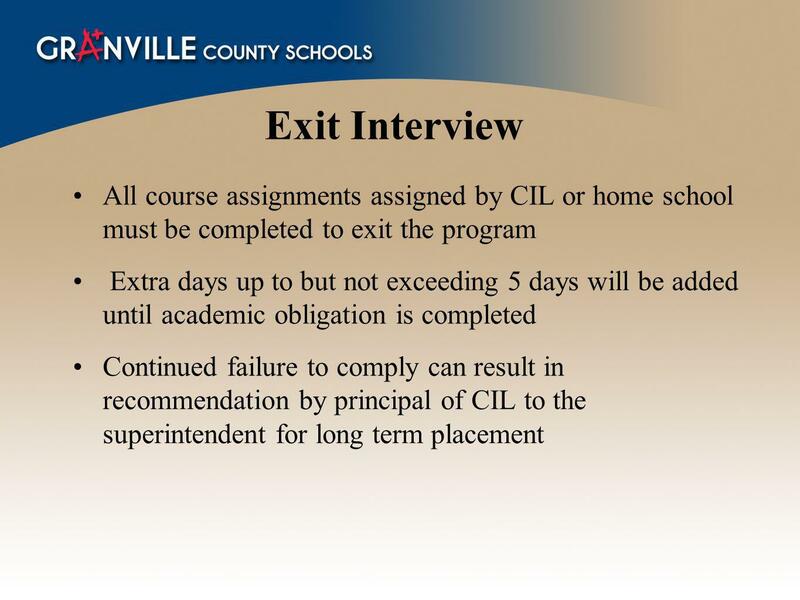 Students will be allowed to complete their school assignments and receive credit for attending school. 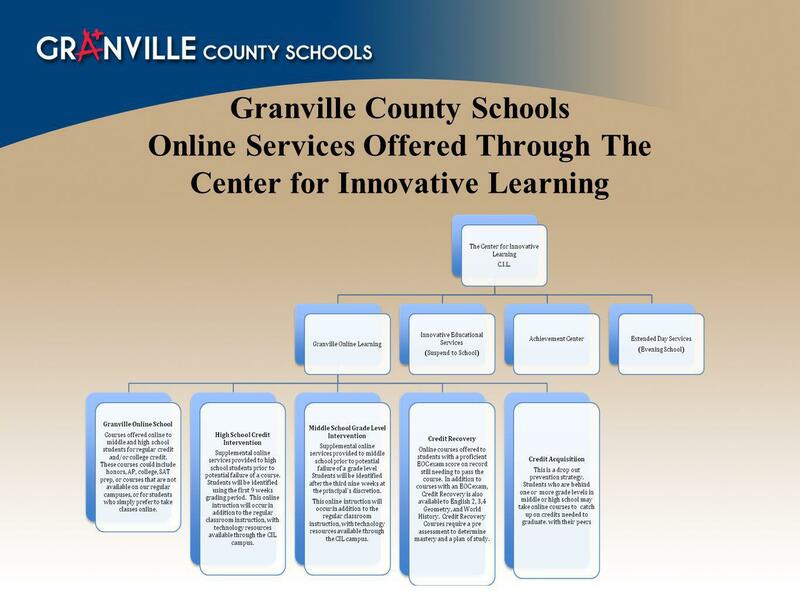 The Center for Innovative Learning staff will help students identify goals and strategies to help them find success when they return to their home school environment. 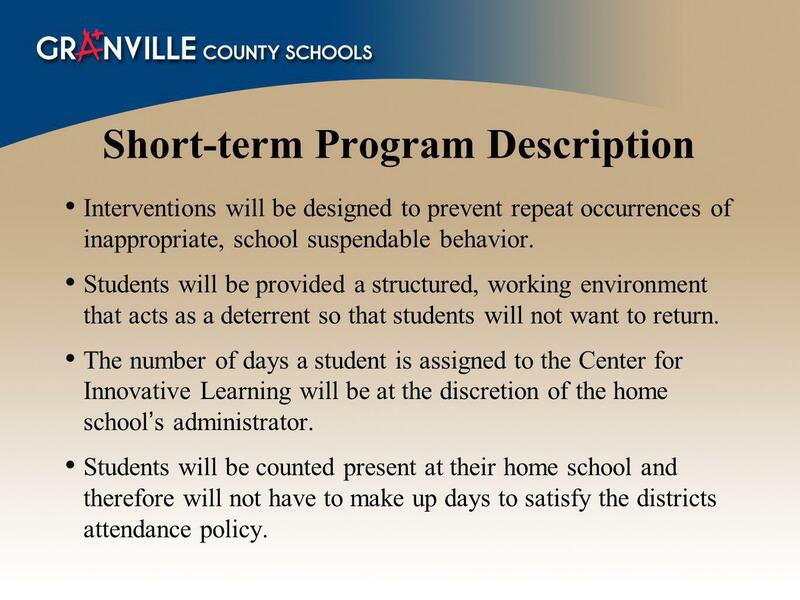 Interventions will be designed to prevent repeat occurrences of inappropriate, school suspendable behavior. Students will be provided a structured, working environment that acts as a deterrent so that students will not want to return. 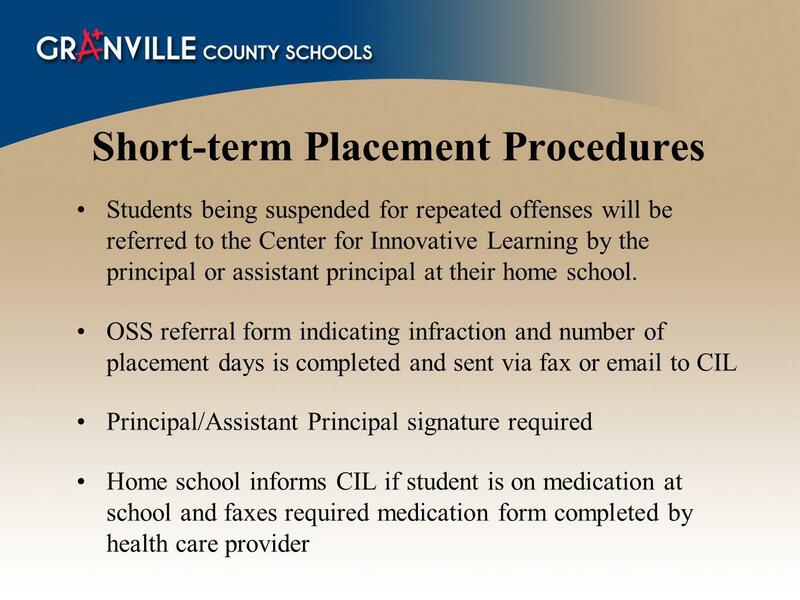 The number of days a student is assigned to the Center for Innovative Learning will be at the discretion of the home school’s administrator. 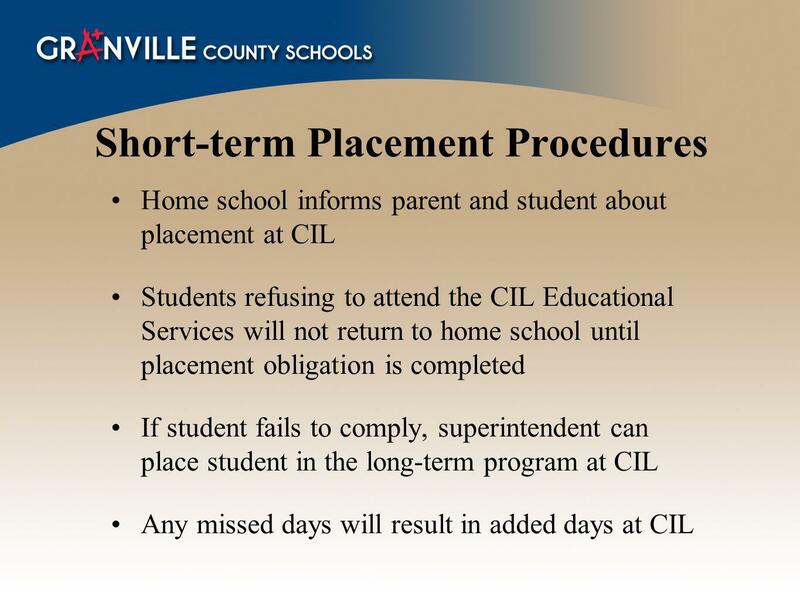 Students will be counted present at their home school and therefore will not have to make up days to satisfy the districts attendance policy. Student violation of bus rules will result in suspension off bus Student will have to be transported by car for term of bus suspension. 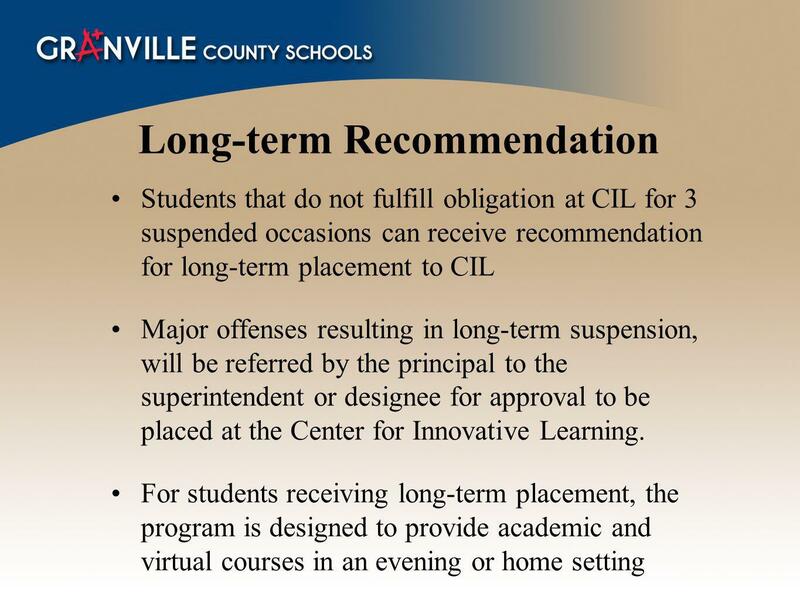 15 Student Agreement Students will be required to sign an agreement stating that they will attend the Center for Innovative Learning and abide by its rules, expectations, and requirements. 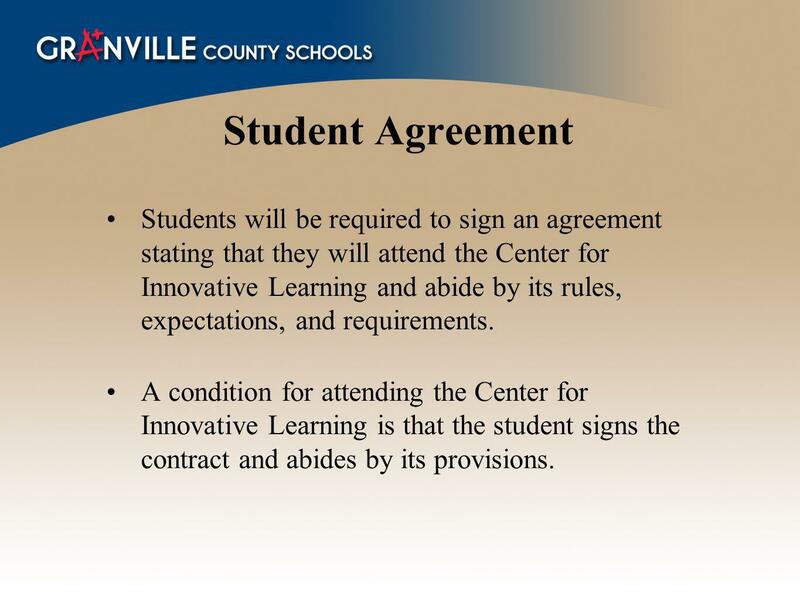 A condition for attending the Center for Innovative Learning is that the student signs the contract and abides by its provisions. 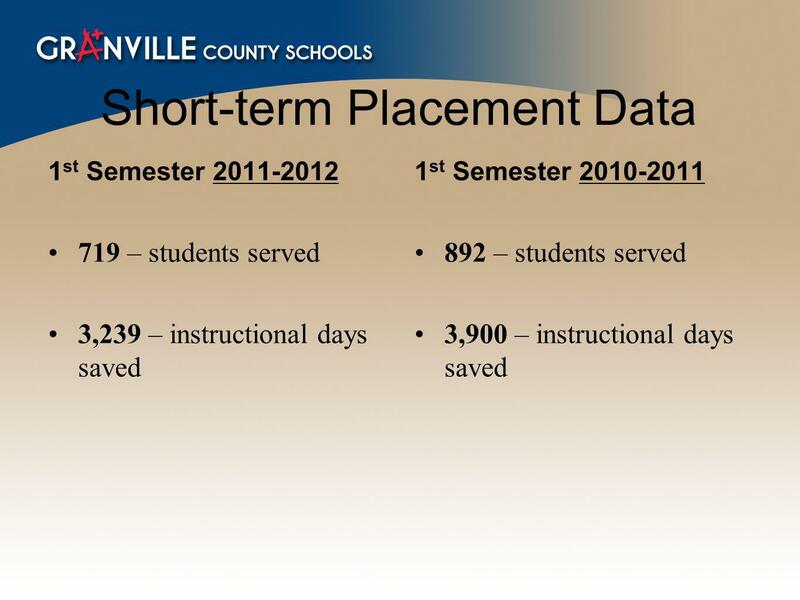 16 Student Assignments Home school teachers should provide work assignments for each day student is enrolled. Teachers from the students home school may send assignments via edmodo.com, the student, fax, or with the bus driver. 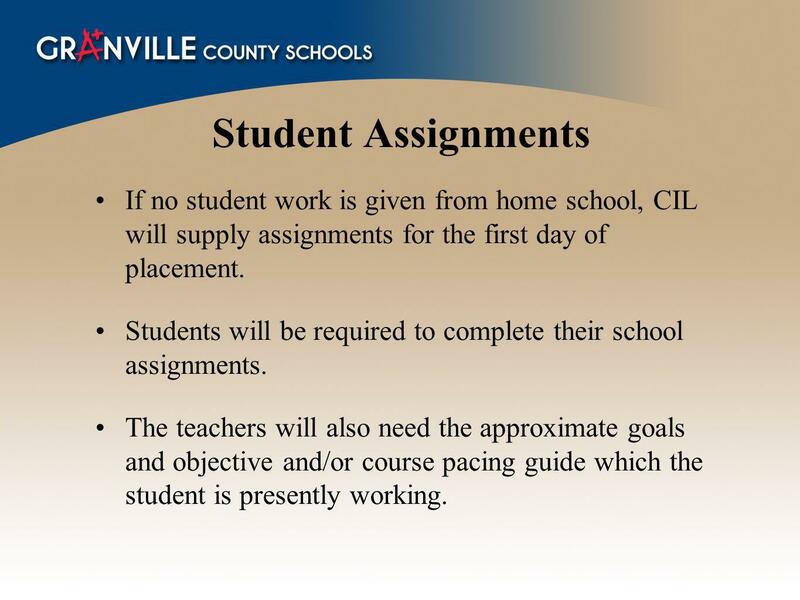 17 Student Assignments If no student work is given from home school, CIL will supply assignments for the first day of placement. 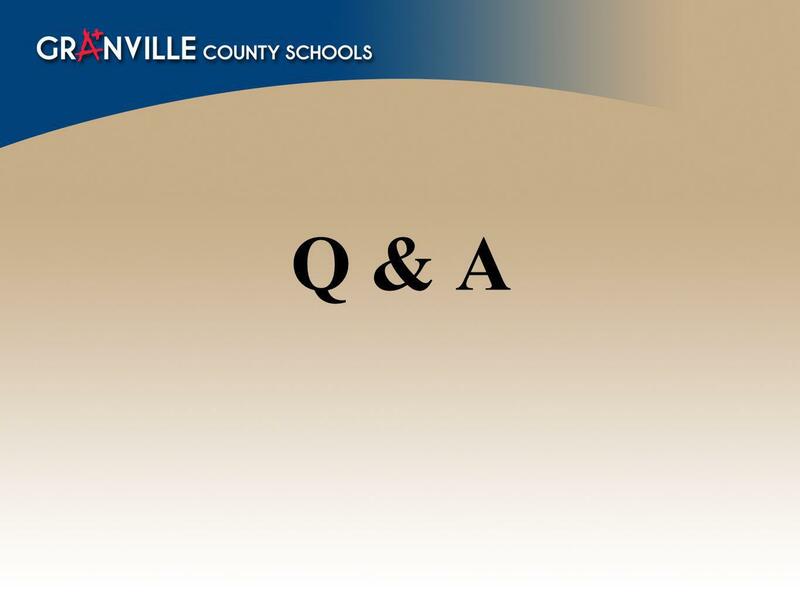 Students will be required to complete their school assignments. 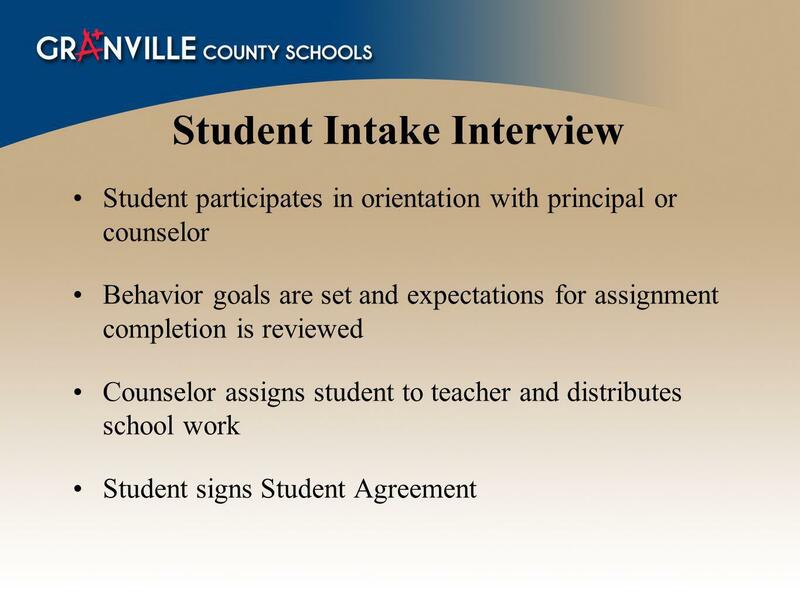 The teachers will also need the approximate goals and objective and/or course pacing guide which the student is presently working. 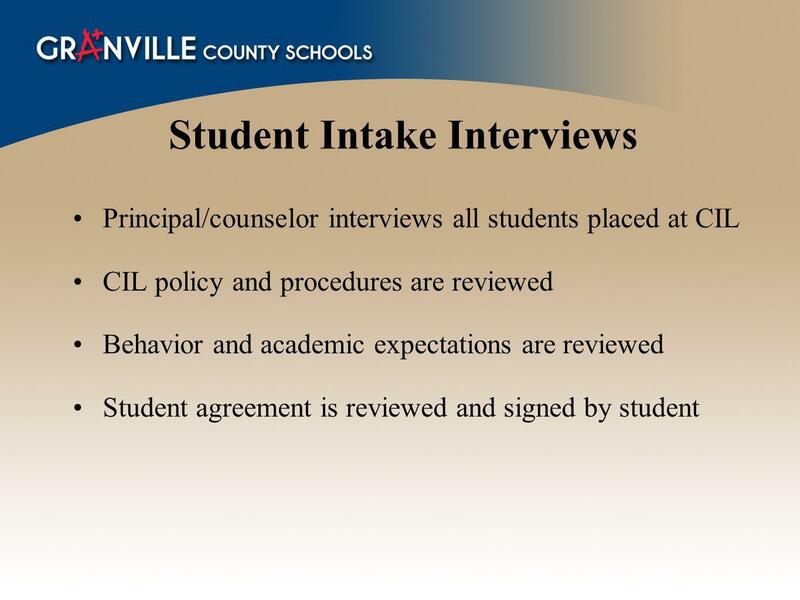 18 Student Assignments Students will be required to bring necessary work materials with them on day of arrival. 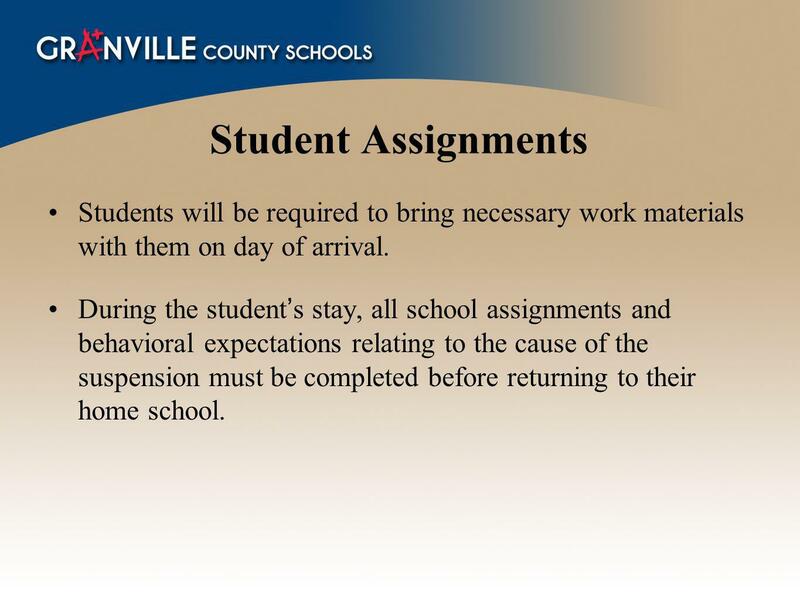 During the student’s stay, all school assignments and behavioral expectations relating to the cause of the suspension must be completed before returning to their home school. 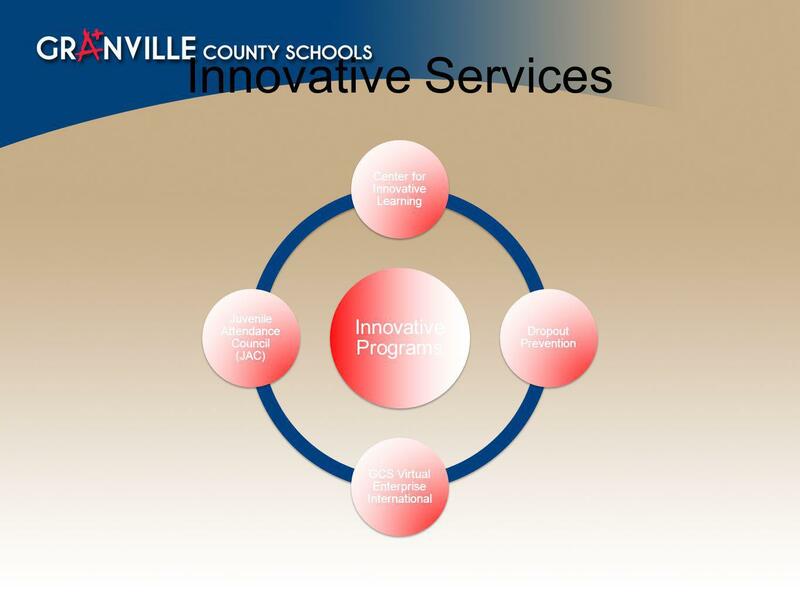 The Center for Innovative Learning may only be used six times by one particular student during the course of the school year. 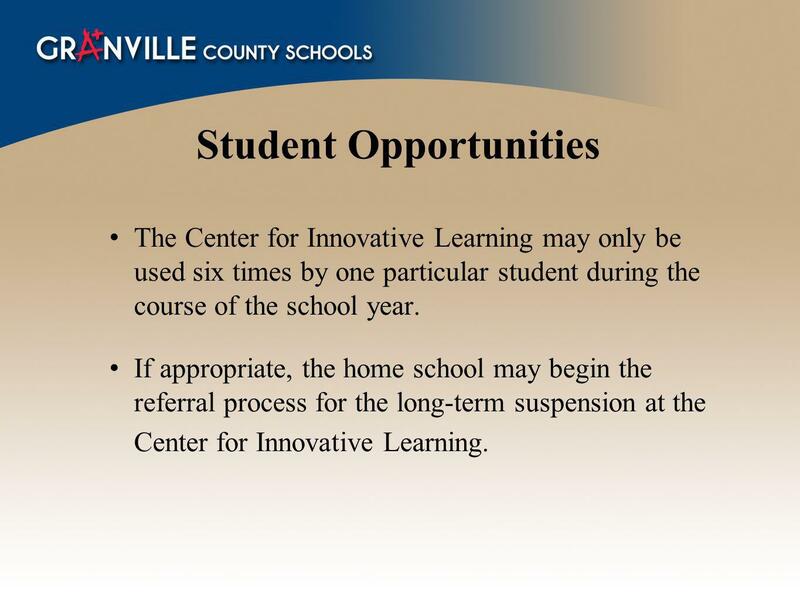 If appropriate, the home school may begin the referral process for the long-term suspension at the Center for Innovative Learning. 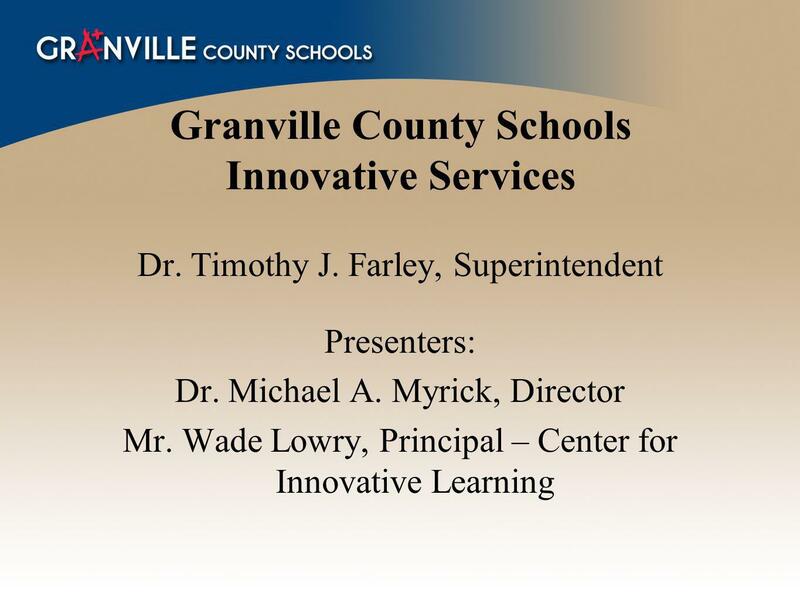 Download ppt "Granville County Schools Innovative Services"
EARLY CHILDHOOD Early Childhood Whats new? 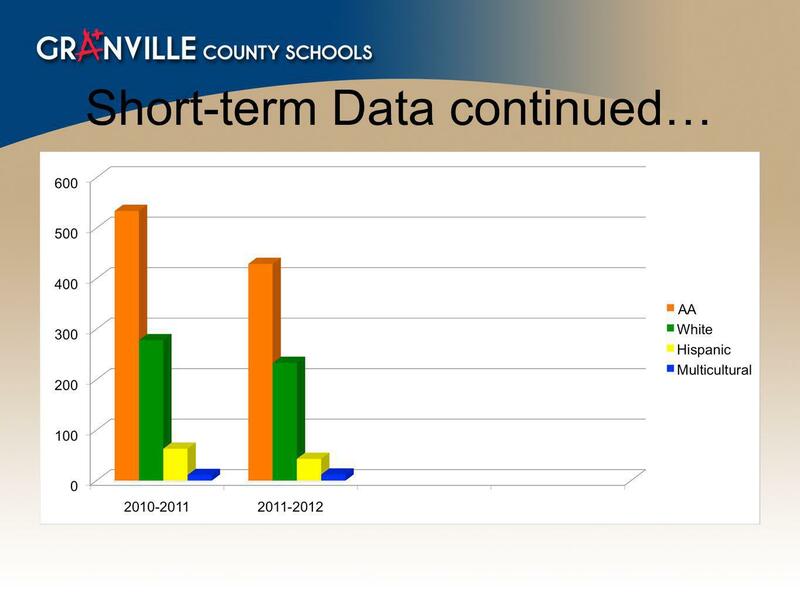 All early childhood evaluations will be completed at the local school. This includes Child. 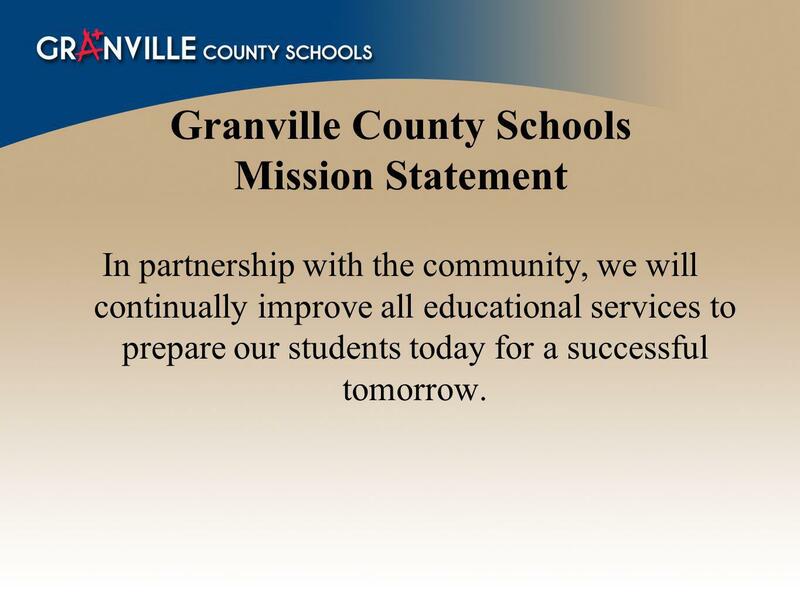 Mission In partnership with the community, we will continually improve all educational services to prepare our students today for a successful tomorrow. Graduation for All!. 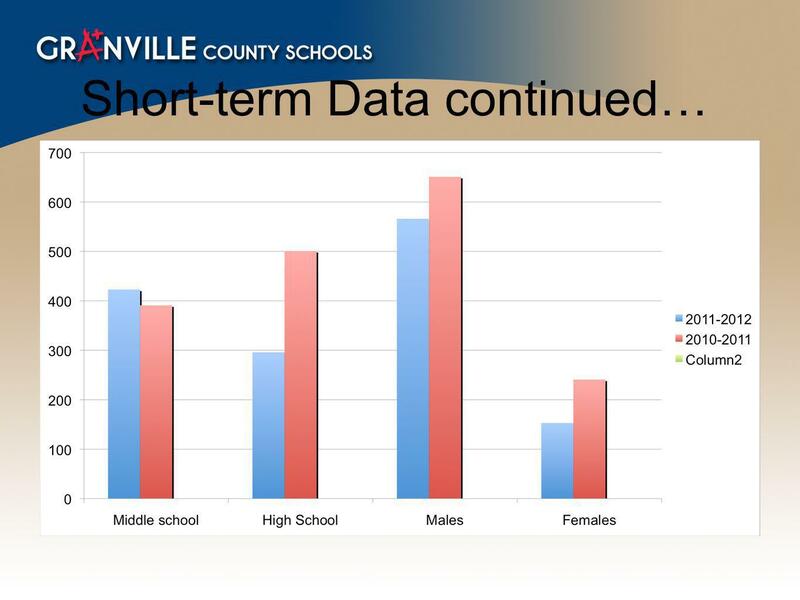 Overview Framing the Dropout Problem – ABCs State and Local Approaches – GED Option – Middle College Dropout Prevention IZ Grants. 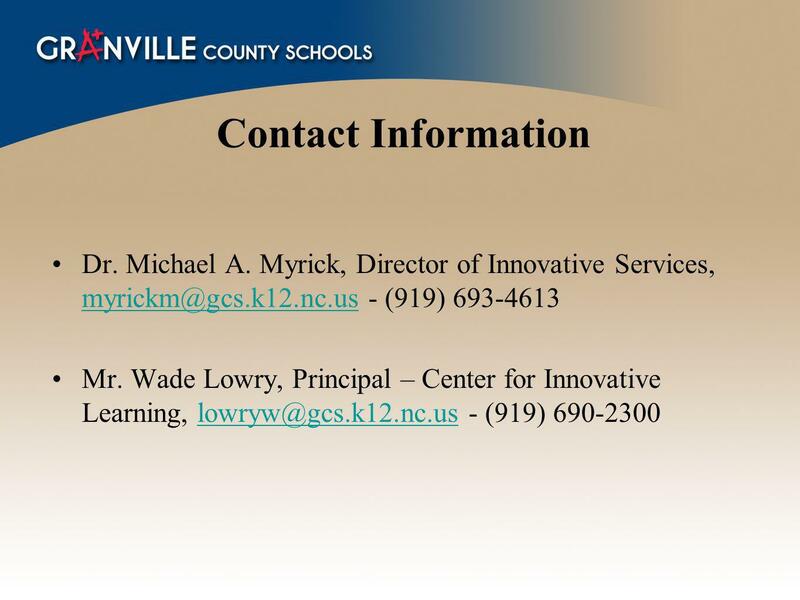 Elementary/Middle School Alternative Education Pilot Grant Application Technical Assistance Conference Call :00 A.M. – 12:00 P.M.
Work-based learning Click on the speaker on each slide to learn more! 1 Discipline Without Delay What You Need to Know 2009 All Rights Reserved. 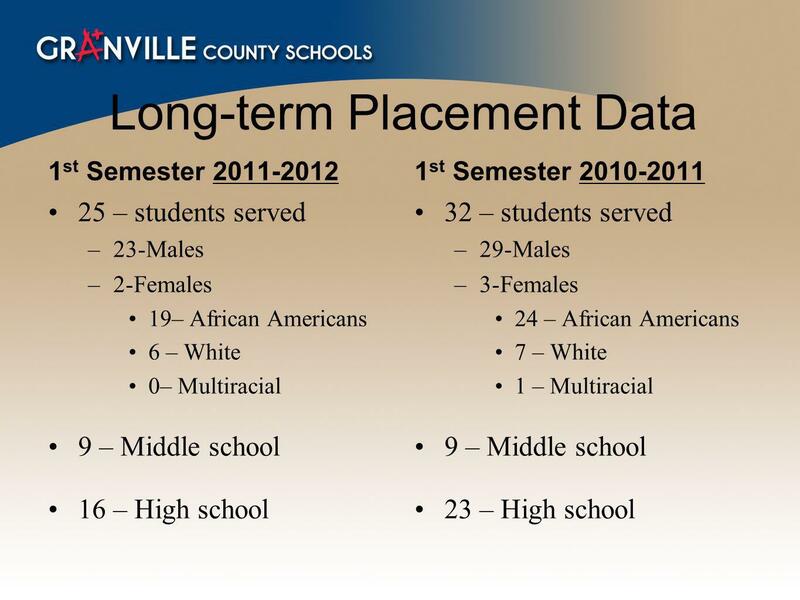 Monroe County Road to Graduation: More Than Just A Passing Lane March 2013 NDPC SD and WVDE. Enhancing Mental Health Services in CMS The School-Based Mental Health Program Cotrane Penn, Ph.D Student Services Department. Georgia Department of Education Division for Special Education Services Deborah Gay, Director. 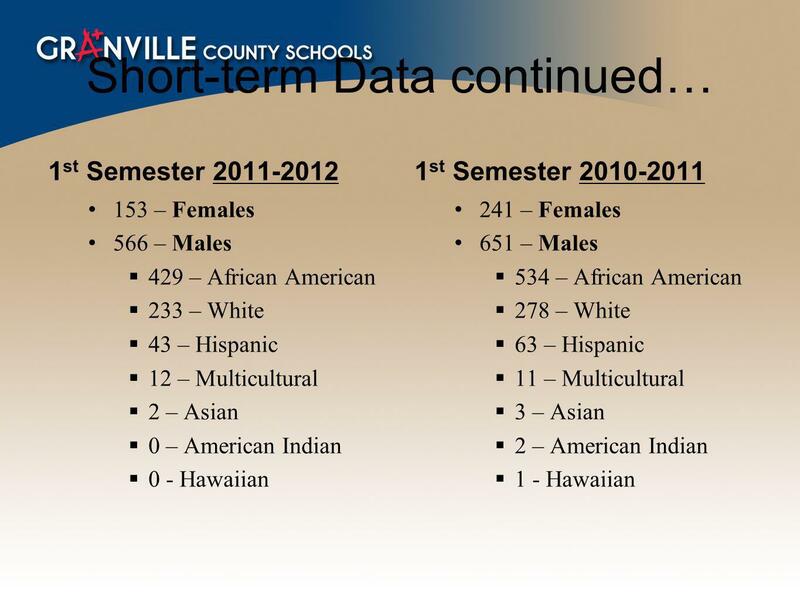 MSIS and Homeless Student Data Tim Benjamin Director of Federal Programs MSIS Primary Contact Union County School District. 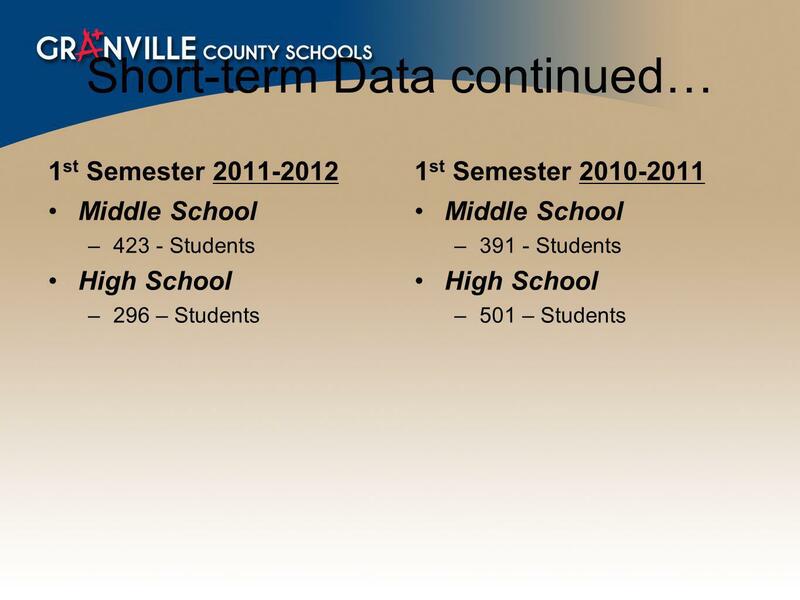 Creating Freshmen Success Task Force Report High School Study Session Board Presentation January 30, 2007. Chapter 222 of the Acts of 2012 THOMAS J. NUTTALL, ESQ. SULLIVAN, NUTTALL & MACAVOY, P.C. 1020 PLAIN STREET MARSHFIELD, MASSACHUSETTS 02050 (781) 837-7428.